​WINTER SPECIAL - STAY 2 NIGHTS, GET THE 3RD NIGHT FREE-JANUARY THRU APRIL. 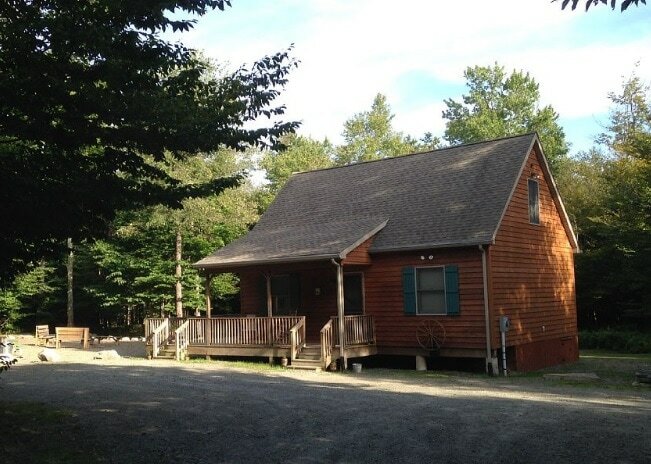 ​Bear Tracks Cabin is in a peaceful mountain setting. Secluded enough to get away from it all, but within driving distance to activities. Wrap around deck with rocking chairs, picnic table, children's picnic table, chairs and benches. Fire ring with wood provided for campfire. Charcoal grill. Fully furnished. 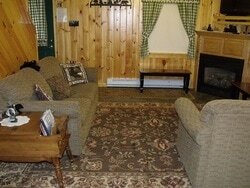 Full kitchen includes full size refrigerator, stove with oven, microwave, pots, pans, dishes, silverware, cups. All you need to bring is your food. Full bathroom with shower, towels provided. Sleeps 8 - bedroom with queen size bed, bedroom with 4 twin beds, TV room with double bed futon. Bed linens supplied and beds made for arrival. Ceiling fans throughout. Electric heat and gas fireplace. 2 TV's with DVD players. Family movies and games. ATV's welcome. Non-smoking, no pets allowed. Beautiful Fall Foliage. ​Walk the mile loop, you may see deer, porcupine, wild turkeys, quail and maybe even a bear. Great stargazing, telescope provided. Grocery store, pharmacy, pizza place and mini market 20 minutes down the mountain. Past that is Walmart, fast food, and family restaurants. Only 40 minute drive to Wellsboro and PA Grand Canyon. 30 minutes away is Hills Creek State Park and Tioga-Hammond Lake, both have swimming, fishing, boating, hiking, picnic area. 40 minutes North is Corning Museum of Glass, and Watkins Glen State Park for walking through waterfall area. All make great day trips and then come back to the peacefulness of the mountain. Open year round. Winter Special - January through April - stay 2 nights, get the 3rd night free.